There are two types of matter in the brain: grey matter and white matter. Grey matter receives and stores impulses. Cell bodies of neurons and neuroglia are in the grey matter. White matter in the brain carries impulses to and from grey matter. It consists of the nerve fibers (axons). The spinal cord is along tube like structure which extends from the brain. The spinal cord is composed of a series of 31 segments. A pair of spinal nerves comes out of each segment. The region of the spinal cord from which a pair of spinal nerves originates is called the spinal segment. Both motor and sensory nerves are located in the spinal cord. The meninges are three layers or membranes that cover the brain and the spinal cord. The outermost layer is the dura mater. The middle layer is the arachnoid, and the innermost layer is the pia mater. The meninges offer protection to the brain and the spinal cord by acting as a barrier against bacteria and other microorganisms. The Cerebrospinal Fluid (CSF) circulates around the brain and spinal cord. It protects and nourishes the brain and spinal cord. The cell body has several highly branched, thick extensions that appear like cables and are called dendrites. The exception is a sensory neuron that has a single, long dendrite instead of many dendrites. Motor neurons have multiple thick dendrites. 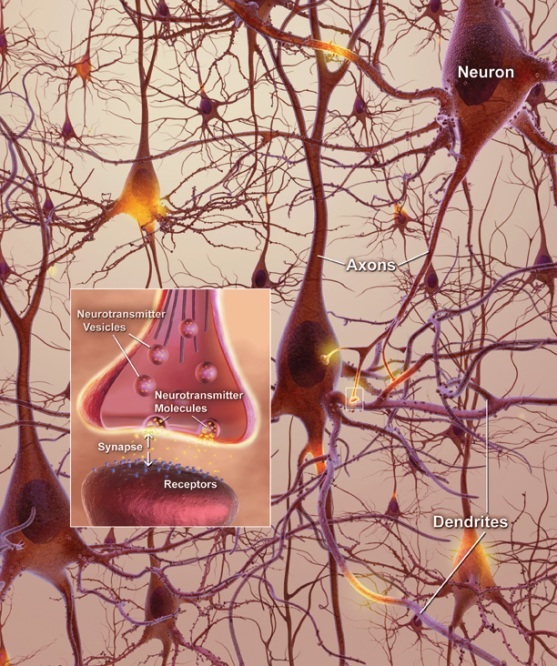 The dendrite's function is to carry a nerve impulse into the cell body. The neuron is covered with the Myelin Sheath or Schwann Cells. These are white segmented covering around axons and dendrites of many peripheral neurons. The covering is continuous along the axons or dendrites except at the point of termination and at the nodes of Ranvier. The neurilemma is the layer of Schwann cells with a nucleus. Its function is to allow damaged nerves to regenerate. Nerves in the brain and spinal cord do not have a neurilemma and, therefore cannot recover when damaged. Bipolar neurons have one axon and one dendrite. These are seen in the retina of the eye, the inner ear, and the olfactory (smell) area. This nervous system controls the nerves of the inner organs of the body on which humans have no conscious control. This includes the heartbeat, digestion, breathing (except conscious breathing) etc. The Enteric nervous system is the third part of the autonomic nervous system. 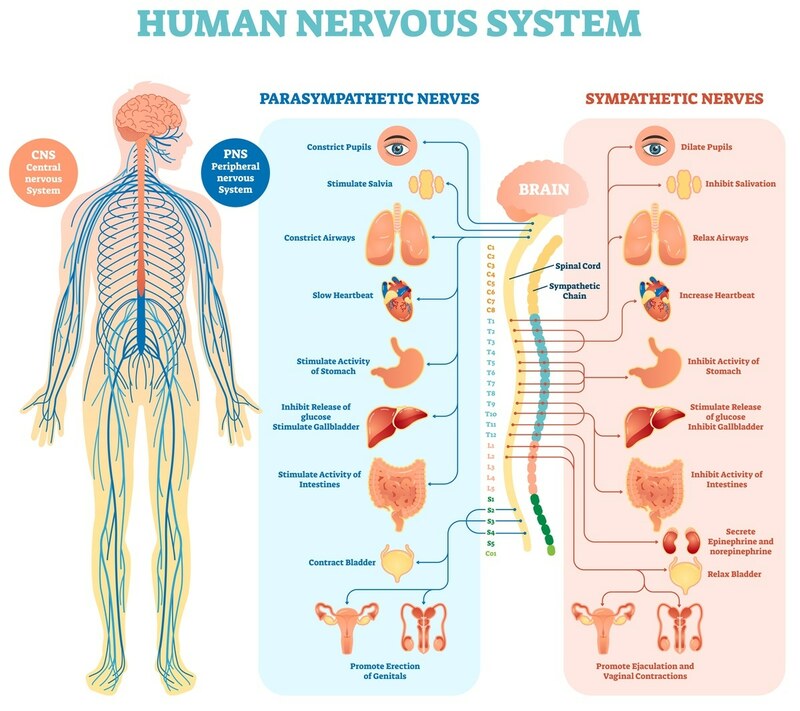 The enteric nervous system is a complex network of nerve fibers that innervate the organs within the abdomen like the gastrointestinal tract, pancreas, gall bladder etc. It contains nearly 100 million nerves. The smallest worker in the nervous system is the neuron. For each of the chain of impulses there is one preganglionic neuron, or one before the cell body or ganglion, that is like a central controlling body for numerous neurons going out peripherally. The preganglionic neuron is located in either the brain or the spinal cord. In the autonomic nervous system this preganglionic neuron projects to an autonomic ganglion. The postganglionic neuron then projects to the target organ. In the somatic nervous system there is only one neuron between the central nervous system and the target organ while the autonomic nervous system uses two neurons. Is there a drug that can reduce the dizziness from a person who had a stroke? Thank you for your support and assistance on this matter.